The latest successful launch of the long-range Agni-IV missile from Wheeler Island is yet another feather in the cap of the Defence Research and Development Organisation (DRDO). The two-stage solid-propelled missile, which has a range of 4,000 km, is capable of delivering nuclear weapons. The missile performed well, and fulfilled various parameters required for it. The design has now proved itself, and the missile accurately hit its target. That this launch was carried out from a mobile launcher adds to its strategic capabilities, since from now such missiles could be transported on roads and launched from mobile launchers. It will, however, be a while before this missile is inducted into the armed forces, since more developmental trials are scheduled. India has achieved remarkable success with missiles, especially the Agni and Prithvi series. The stress on indigenous technology has paid off and various facilities spread across the country, including around Chandigarh, have played a prominent role in conducting research and producing the components necessary for the success of the DRDO’s missiles. They too deserve to be commended for their success. India’s Integrated Guided Missile Development Programme has come a long way in producing and launching missiles, and the DRDO has, over the years, built a solid base which is now yeilding rich dividends. It is true that challenges remain, especially in producing reliable indigenous radars, but overall, much has been done, and continues to be done in this difficult, and, at times, treacherous endeavour. Even as India continues to maintain its no-first-use nuclear policy, it needs to have a credible deterrent force of weapons and missiles, especially since two of its neighbours have their own arsenals. While it cannot compare with China in technology or numbers, long-range missiles will provide the nation with the strategic strength it may need. Similarly, advances in submarine-launches missiles too are of immense strategic significance. In March this year an international conference was held at Phnom Penh, Cambodia, on ASEAN, marking the end of 10 years when Southeast Asian countries signed the Declaration of Code of Conduct Agreement to undertake cooperative activities on joint exploration with China, without resorting to force. The year also signifies the tenth year of the 1st ASEAN-India Summit and an end to the period of two decades when India flagged its East Asian policy of engagement. Echoing the sentiments, the then Indian Prime Minister had said in Singapore in 2002 that the South-East Asian region was one of the focal points of India’s foreign policy, strategic concerns and economic interests. It not only institutionalised ASEAN- India relations, but also considered an acknowledgment of India’s emergence as a key player in the Asia Pacific region. Of late, there has been an increasing interest among ASEAN nations for India. It was demonstrative of India being a strong powerhouse on the economic, trade and security fronts as also the practitioner of profound resilience in managing conflicts, now plaguing the South China Sea. The belief is that a strong India is in the ASEAN strategic interest as a strong ASEAN is good for India. Considering such prophetic views, India’s engagement with ASEAN for two decades has seen a two-way increase in the export level which is more than the global average. According to the 1st India-ASEAN business conclave held in New Delhi in February 2012, the two are committed to achieving a trade target of $70 billion by this year. It would put us on a par with our trade with China, highest with any other country. India and ASEAN provide a huge market to harness the potential and the competitive edge in the global economy, which certainly demands a systemic exploration of emerging economic opportunities between the two, hitherto dominated vigorously by the Chinese. This also includes the prospective role Indian diaspora could play in expanding investment relations with India. However, the beginning of 2005 saw ASEAN becoming a major focus of Chinese diplomacy, throwing up appreciable concerns, and identifying China as a primary potential threat from the stand-point of ASEAN nations. The Chinese exclusive claim to the South China Sea and their official announcement that it is their core interest akin to Tibet and Taiwan do not rule out the use of force in the region. The South China Sea is significant as a vast reservoir of oil and natural gas and fishing wealth. It is, in fact, the demographic hub of the 21st century where the Chinese, ASEAN and inhabitants of the Indian subcontinent transact vital resources and exchange goods across the region and globally. More than half of the world annual merchant fleet tonnage passes through it; the US trade moves in the area is to the level of $1 trillion with an investment of $160 billion. India, too, has a natural sphere of influence in the South China Sea, acquired traditionally over the centuries. It was also called the Champa Sea at the height of Indian Champa rule in Cambodia and Vietnam. It is not only the gateway to India’s trade with ASEAN, but also a navigable route from the Sakhalin oil base to Mangalore covering a distance of 5,700 nm. India has an investment of $400 million in Vietnam hydrocarbons with its OVL investment of $225 million in oil exploration projects dating back to the mid-80s. ONGC Videsh Ltd along with PETRONAS of Malaysia are also in joint collaboration in the hydrocarbon sector. Aban Offshore Limited, Mumbai, has been awarded two contracts worth $55 million to drill 9 oil wells in Malaysia. Of late, even the Philippines called a part of the sea as the West Philippines Sea. In the geo-strategic and economic realm, it is an extremely significant body of water containing over 250 small islands, atoll, clays, shoals, reefs and sand bars with no habitation in most of them. The main islands under dispute are the Paracel and Spratly. In this regard, making a candid assessment of Chinese behaviour, India provides a greater transparency on Chinese assertiveness which should be worrisome for ASEAN. This is notwithstanding the fact that, akin to ASEAN nations, India too enjoys a bilateral strategic economic dialogue with China. However, China is a competitor and looks to India as a potential contender for a leadership role in Asia. India has a historical opportunity to provide a meaningful role in the current imbroglio, especially when its political and economic vitality is preferred over China by ASEAN. Analysing the larger concern of the ASEAN nations, which want to transform the South China Sea into a maritime control issue, designed to promote peace, friendship and trade, it is the China factor which has a potential to shift its entire dynamics, being a major power. It has put the area in the category of non-negotiable territorial claim. The ASEAN nations are equally non-willing to make concessions with regard to their territorial claims but for the lack of consensus. The United States has in July 2010 at an ASEAN Regional Forum meeting declared the area in the American national interest, for securing trade and strategic interests, ensuring an uninterrupted navigational route to the Pacific. However, one is constrained to believe about their actual physical involvement once the die is cast. The US has strengthened its relations with Vietnam, Indonesia, the Philippines and Singapore, besides enjoying a treaty obligation with Japan. But, given the disturbed scenario in the region and its relations with China, the major interest of the US in the South China Sea remains debatable. There has been a remarkable shift when India showed credibility in dismissing Chinese reaction to India’s offshore exploratory activities in Vietnamese waters as invalid and without any legal basis. The brutality of the message became more evident when India openly declared that the South China Sea must remain free for navigational purposes and sought to resolve all sovereignty issues in consistent with the international law. It is significant for India to maintain, therefore, its visible presence in ASEAN and promote all kinds of cooperative relationship with member-countries, including military support, on a sustainable basis. Let us not forget that “Mao’s barrel threatens only those with no hold on the barrel”. The one core issue affecting the countries involved in the dispute, including China, is the overlapping claims of sovereignty in the South China Sea. The United Nations Convention on the Law of Sea (UNCLOS) provides a basis for the coastal countries to manage threats of maritime security in an ideal manner. In the case of the South China Sea, where all states are members of the convention, there is a race for generating and extending the maritime domain areas and exercising sovereign rights over them in consonance with the provision of UNCLOS. The historical claims certainly can raise the pitch, but may lack legal scrutiny. India is in the immediate neighbourhood of ASEAN. This strategic contiguity demands that both must stand together as a single economic community, depending on their comfort levels. The current situation in the South China Sea presents a case for ASEAN and India to collaborate more closely where India needs to be pro-active in building a new vibrant ASEAN order, free of any turbulence. It will not only help India to become a major stakeholder to the oceanic wealth that ASEAN shall provide, but also forge a dominating strategic bond which will be mutually supportive and will have an appreciable endurance. The writer is Professor and Head, Department of Defence and National Security Studies, Panjab University, Chandigarh. NEW DELHI, (SANA): Army Chief Gen Bikram Singh said the Indian military would not like to move out of the strategically important” icy heights for which a “lot of blood has been shed”. He made the statement at a time when Pakistan is pushing for demilitarisation of Siachen. Talking to media persons, Gen Singh stated that the Army has conveyed its views to the government which has to take a final decision in this regard. “It is very important and we must continue to hold that area and we have held that view always…. We have lost our lives and lot of blood has been shed to get into these areas and occupy the heights and positions,” he said. “These positions are of strategic importance and we have given our concerns to the Government and now it is for the Government to decide,” Gen Singh said. Pakistan has been pushing for demilitarisation of Siachen but India has maintained that this cannot take place without proper authentication by both sides of the present troop positions on the glacier. Gen Singh said the Army has not changed its views on the importance of the strategic heights which have been under Indian physical control since 1984 after the Army launched to Operation Meghdoot to occupy them. Army chief alleged that Chinese soldiers are present in Pakistan Administered Kashmir (PAK) to provide security to its ongoing railways and road projects there. “We are told that Chinese soldiers are there to provide protection to their ongoing projects related to their railways, road and hydro-electric projects and it is basically for security purposes,” Gen Singh said. “We have already conveyed this to the Government and whatever is there, we have our frontiers guarded well,” Singh said when asked if the presence of Chinese troops in PAK was a matter of concern for the force. India has already expressed its concerns to China over the presence of its troops in PAK. Reports in the recent past have suggested that around 4,000 Chinese troops are present in PAK. “No. It will not be repeated. I am assuring the nation as Chief of the Army Staff that 1962 will not be repeated. No way. Country’s borders are well protected and the Army will not allow the enemy to cross it,” he said. In next few months, it will be 50 years of Sino-India war during which the Chinese force had crossed over and entered territories in the north and northeastern region. “I am not talking about any country. I am only assuring as Chief of the Army Staff. We have plans in place to safeguard the territorial integrity of our country. That is the assurance I am giving you,” he said. When asked if he was satisfied with infrastructure development in the Northeast especially Arunachal Pradesh, the Army Chief said several projects were going on there but “yeh dil maange more (the heart wants more)”. Indian army chief said that border with China at Arunachal Pradesh is safe but random incidents of violation of border by Chinese army occurred time to time. Interacting with journalists, Gen Singh said the findings of the Courts of Inquiry (CoIs) are awaited in two recent incidents and suitable steps will be taken on its basis. This year in May and August two such incidents were reported in units located at Nyoma and Samba in Jammu and Kashmir where scuffle broke out between the jawans and the officers. One such incident had reportedly taken place in 2010 in Gurdaspur in Punjab. Terming the incidents as “aberrations” and “isolated” ones, the Army Chief said his concerns were to ensure that the environment at the unit-level is suitable for growth and upholding the military values. “As you know we had one or two instances, these are aberrations of course and these were isolated incidents. One was in 2010 and in recent past we had two incidents,” he said. Gen Singh said integrity, duty, loyalty, respect, selfless service, courage and honour are some of the values taught by Army and he has been speaking about upholding them during his visits to various Commands and other military locations. 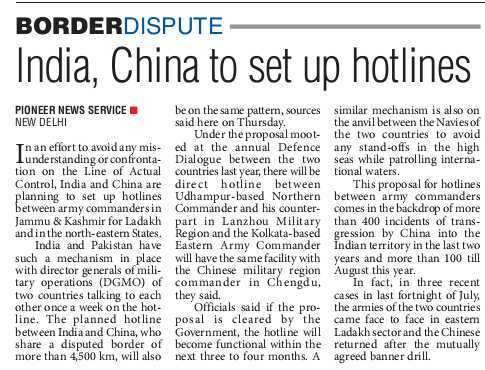 New Delhi: Aiming to avoid any misunderstanding on their borders, India and China are planning to set up hotlines between army commanders in-charge of their respective border areas along Jammu and Kashmir and Northeastern states in the next three to four months. Under the proposal, there will be direct hot line between Indian Army's Udhampur-based Northern Commander and his counterpart in Lanzhou Military Region and the Kolkata-based Eastern Army Commander will have the same facility with the Chinese military region commander in Chengdu, sources said here. They said if the proposal, first mooted at the Annual Defence Dialogue between the two sides last year, is cleared by the Government, the hotlines would be set up within next three to four months. A similar hot line is being worked out between the Navies of the two countries to avoid any stand-offs in the high seas while patrolling international waters. 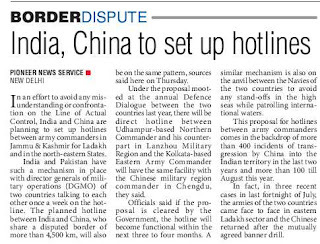 The proposal to set up a hot line comes soon after the troops of the two countries came face to face in July near Chushul in Ladakh while patrolling a disputed area and disengaged only after laying claims on it through the banner drill. More than 400 transgressions by the Chinese troops have been reported in Indian territory in the last few years. India and China have a long-pending border dispute over and China over which they have held 15 round of talks between the Special Representatives of the two countries. At present, India has such an arrangement with Pakistan where the Director Generals of Military Operations (DGMO) get in touch with each other in case of tensions at the LoC or the international border. The arrangement worked well recently when an Indian Army helicopter by mistake went inside Pakistan but was allowed to return safely after the two DGMOs talked. Amidst Pakistan pushing for the demilitarisation of Siachen, Indian Army Chief General Bikram Singh said that India had "lost lot of lives" and "shed a lot of blood" to command the icy heights and favoured holding on to the 70-km-long glacier in northern Jammu and Kashmir. Gen Singh also noted that Siachen glacier, the world's highest battlefield, is of "strategic importance" to India and that the Indian Army's position on withdrawal of troops from one of the most uninhabitable spots on earth remained unchanged. "We have lost a lot of lives over there. We have shed a lot of blood in trying to get to that area and occupy our positions. These positions are of strategic importance to us," he told reporters during an interaction here on Wednesday. "It has not changed at all," he said when asked about the Indian Army's position on Siachen and the demilitarisation proposed by Pakistan. "It is very important...we must continue to hold that area and that's what we have maintained always," he asserted. India and Pakistan are currently negotiating a settlement of their 18-year dispute over the Siachen glacier and one of the issues being discussed is demilitarisation. It may be noted here that after recent soldier-officer stand-offs in two key units deployed in Jammu and Kashmir, Indian Army chief said the 1.13-million force has been asked to focus on "getting back to the basics". Gen Singh said the endeavour now was to ensure the climate in the army units remained "conducive for growth and cohesion" of the personnel. "It is nothing else but back to basics," he replied when asked about the troops clashing among themselves and the measures taken to prevent such occurrences. "As you know, we have had one or two incidents and these are aberrations...they were isolated incidents. Three incidents...one in 2010 and two in recent months," the General noted. The recent violence involved 16th Cavalry regiment in the Samba sector of Jammu and Kashmir on Aug 8 when soldiers and officers clashed over the reported suicide of a soldier. Earlier this year, soldiers and officers of the 226 Field regiment clashed during a field firing training at Nyoma in Ladakh, very close to the Line of Actual Control with China. In 2010, the incident involved the 45 Cavalry regiment when they were deployed in Gurdaspur, Punjab. The Army Chief admitted that shortage in the officers cadre -- about 10,100 vacancies at present -- was "one of the main reasons" for troubles. Army units are functioning with half the officers' sanctioned strength. Most battalions have just about 10 officers, where the officers strength needed is over 20. Regarding the two recent clashes, Gen Singh said the court of inquiry are to be concluded and once the findings are made available to him, necessary measures would be instituted. New Delhi, Sep 20 — The government is set to give the Indian Air Force (IAF) more firepower and capabilities during its 80th anniversary year: New combat and heavy-lift helicopters. Authoritative sources told India Strategic (www.indiastrategic.in) that the financial bid for the Boeing Apache AH-64D had been opened mid-September while that of the two helicopters in the heavy-lift competition - the Boeing Chinook CH-47F and the Russian Mi-26 - should be opened before September-end or so. It should not take much time to announce the selection as the company with the lower bid would win the deal(s)s to supply the helicopters. Perhaps, the two choices should formally be announced on Air Force Day on October 8, but possibly before. In the case of the combat helicopter competition, Russia had withdrawn its Mi-28 earlier this year, leaving the field open only to Boeing. So in this case, Boeing will be the winner for the deal to supply 22 helicopters for around $1.4 billion at the estimated market price. Boeing's quote is, of course, secret. As for the heavy-lift helicopters, the Chinook CH 47F is technically regarded as "more capable" than the Mi-26 but then, the Russian craft carries more under-slung cargo. the IAF will have to make a tough choice here as the Russian machine is not being manufactured now. 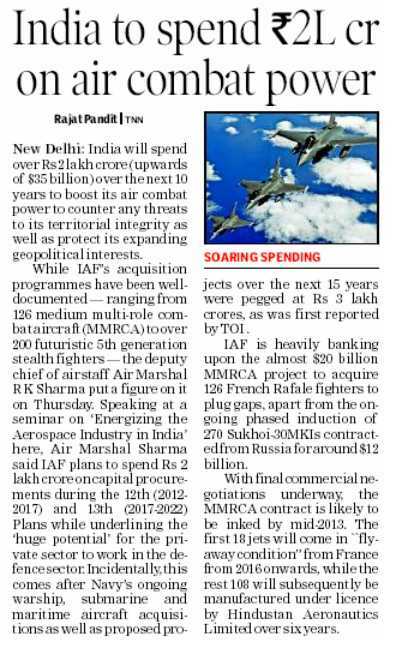 Notably, the acquisition programmes of the IAF and the Indian Navy have been on a rather fast track while that of the army has been delayed due to recall and/or revision of several RfPs and other issues. The government has already cleared a comprehensive upgradation of the IAF's airfields through a programme called MAFI (Modernisation of Airfield Infrastructure), a sophisticated communication network called AFNET, more midair refuelers and AWACS, Pilatus basic trainers, additional transport aircraft - including the C-130J Super Hercules and C 17 Globemaster III - and the selection of the French Dassault Rafale medium multi-role combat aircraft (MMRCA). 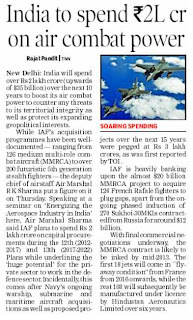 Sources also told India Strategic that negotiations with Dassault and other stakeholders like systems supplier Thales and engine-maker Safran-Snecma were proceeding smoothly and the deal should conclude within this financial year (ending March 2013) if not in this calendar year. The package of offsets, transfer of technology and partnerships to produce various systems in India is being negotiated. Several delegations have visited the defence ministry and IAF headquarters in New Delhi and HAL facilities in Bangalore. Hindustan Aeronautics Limited is the lead integrator for the MMRCA project. The IAF also has four big-ticket deals with Russia: more than 270 SU-30MKI fighter jets, 80 Mi-17-1V helicopters, joint production of a multirole transport aircraft (MTA) and an Indian variant of the PAK-50 fifth generation fighter aircraft that will be the arrowhead of the IAF in the 2020s. Periodic upgrades are also on. The MiG-29 upgrade has been sanctioned while that of the Jaguar is under consideration. Significantly, defence manufacturers are supported in negotiations by their respective governments, even if the deals are what is known as DCS (Direct Commercial Sales). French diplomats are supporting the MRCA process and US and Russian diplomats their countries' respective equipment. The Boeing Chinook is on a DCS offer, while the Apache deal is on both commercial and the US Government's Foreign Military Sales (FMS) programme, for which the Department of Defence charges a fee of between 2.5 to 5 percent. Certain systems on the Apache, like the Longbow radar and weapons, are proprietary for the US Army. The Longbow, made by Northrop Grumman, can scan up to 256 targets within 30 seconds - and that's a formidable, unmatched capability. Interestingly, Raytheon's Stinger air-to-ground missiles are on board the Apache, as also other IAF, Indian Army and Navy helicopters. The US has offered the latest Block-III version of the Apache to India. This model has 26 technology insertions over the previous model that make the machine network-centric. Network centricity, in fact, is the key for future IAF operations, and mentioned so by its chief, Air Chief Marshal N.A.K. Browne. All air and ground assets of the IAF are currently being networked. Boeing recently invited a group of Indian journalists to visit its various facilities. We were told that the "newest and most advanced Apache, the AH-64D Apache Block-III, features composite main rotor blades, a composite stabilator, 701D engines with an enhanced digital electronic control unit, an improved drive system that enhances the rotorcraft's performance and 26 new technological insertions". Ever since the first Apache rolled out in 1984, its various versions to date have logged more than 3.5 million fight hours. The aircraft took part in the first Gulf War in 1991, where this writer witnessed the helicopter, and then again in 2003 against Iraq. It is deployed on regular combat missions in Afghanistan and during the May 2011 operation to kill Osama bin Laden in Pakistan, it was used to provide air cover for the raiding Black Hawks used by the US Navy commandos. The Apache is powered by two GE T700-701D engines and has ballistic protection for the two-man crew and fuel tanks. It was perhaps the first helicopter to use Kevlar and composite materials for weight-reduction and protection. Strengthening its capability to detect arms and ammunition, the army will procure full-body truck scanners to check cargo which will be deployed in insurgency-hit areas such as Jammu and Kashmir. There is a proposal to procure full-body scanners for checking cargo in trucks for the Military Intelligence and it will be discussed at the next meeting of Defence Acquisition Council (DAC), sources told PTI here. The DAC is the top decision-making body of the Defence Ministry headed by Defence Minister A K Antony. Sources said the scanning equipment is required by the force to be deployed at places in Jammu and Kashmir where cross-border trade routes have been opened across the Line of Control (LoC). "There is an urgent requirement to procure and install full-body truck scanners to scan cargo trucks with goods, including driver's cabin, without unloading and unpacking the cargo to avoid illegal transshipment of restricted items like arms, ammunition and chemicals," army had recently said in a global Request for Information. Once the DAC clears the proposal, the army would be allowed to issue a global Request for Proposal for procuring the equipment. The army has been working to procure these equipment for a long time but two similar attempts have failed. The army was close to finalise a contract in this regard in 2010 but the process had to be scrapped after allegations of corruption. The army wants that the scanners should also be able detect radioactive and nuclear material as well as sniff out various explosives, different types of detonators, circuits, cordex wires, electronic components and chemicals. China on Thursday dismissed as "entirely groundless" Indian Army Chief Gen Bikram Singh's assertion that PLA soldiers were present in Pakistan-occupied Kashmir. "The allegation that Chinese soldiers are present in the Pakistan-administered Kashmir is entirely groundless," Chinese Foreign Ministry spokesman Hong Lei said. Hong first skipped answering a question on Gen Singh's charge at a media briefing here, but later sent an e-mail to PTI denying the allegation. Gen Singh said in New Delhi yesterday that Chinese soldiers were present in PoK to provide security to its ongoing railways and road projects there. "We are told that Chinese soldiers are there to provide protection to their ongoing projects related to their railways, road and hydro-electric projects and it is basically for security purposes," the Army Chief said. "We have already conveyed this to the Government and whatever is there, we have our frontiers guarded well." The issue of the presence of Chinese troops in PoK has been in news since September 2010, after the US media reported that about 7,000 to 11,000 People's Liberation Army (PLA) troops were present in PoK. China subsequently clarified to Indian Ambassador S Jaiashankar, when he took up the issue with top officials here, that its personnel were present in PoK to help people affected by the floods which ravaged the area in 2010. While denying the Chinese troops' presence, Hong stated today that China's stand on Kashmir remained clear and consistent that it was an issue to be resolved by India and Pakistan through negotiations. "Kashmir is left over (by history) between India and Pakistan. As a neighbour of India and Pakistan, China maintains that the relevant issue be resolved through dialogue and negotiations between India and Pakistan." This has been China's stand on Kashmir for long but questions of a possible change in Beijing's stated neutrality were raised after it started issuing stapled visas for residents of Kashmir in 2009, stating that it is a disputed territory. A senior Indian Army General of the Northern Command was not given visa when he was nominated to be part of an official delegation here for talks, prompting India to halt military exchanges with China. The issue was subsequently sorted out after China informally rolled back that policy and started giving visas to Jammu and Kashmir residents as well military officials of the Northern Command. The military exchanges were fully restored later as Chinese Defence Minister Gen Liang Guanglie visited New Delhi early this month. It was the first such visit by a Chinese Defence Minister in eight years. Both the countries have decided to commence military exercises following normalisation of defence relations. About Gen Singh's assertion that there will not be a war similar to that of 1962, Hong declined to react directly but said the relations between the two countries maintained strong momentum and both sides designated this year as 'Year of China-India Friendship and Cooperation'. "Two countries have maintained sound communication and coordination on major regional and international issues. We are ready to work with the Indian side to continue to implement the consensus reached between the two leaders, enhance the mutual trust and mutual beneficial cooperation for the common development," he said. On the boundary dispute, he said "with regard to the border issue, China and India should work together to find a reasonable solution acceptable to both sides through friendly consultations. Pending the final resolution of the border issue we should maintain peace and tranquillity in the border area," he said. Army Chief General Bikram Singh will review the mounted parade organised by the 61 cavalry regiment here on September 23. This is the first visit of Singh to the regiment, the only Horsed Cavalry Regiment of the Army, since taking over, according to Defence Spokesperson S D Goswami. The regiment will parade in walk, trot and gallop, in formations of eight, four and twelve. The training discipline and horsemanship of both horse and rider will be exhibited in a precise and synchronized military display. The parade will salute major General K J S Thind, GOC of 61 Sub Area and South Western Army Commander Lt Gen Gyan Bhushan before the arrival of Chief of Army Staff and Colonel of the Regiment. Visual display of colour of military pageantry will be witnessed by officers, JCOs and soldiers of Jaipur Military Stations, NCC cadets, school children and a number of civil dignitaries. 61 Cavalry celebrates September 23 every year as "Haifa Day" to commemorate the heroic cavalry charge against the Turks on the same day in, 1918 at Haifa (Palestine) during the First World War by the 15th Imperial Cavalry Brigade. The brigade consisted of Indian State Forces Cavalry units of Jodhpur, Mysore, Hyderabad and Patiala Landers. The regiment has accredited itself with distinction in operational, ceremonial and sporting tasks. It has the unique distinction of being awarded one Padam Shree and ten Arjuna awards for excellence in sports. 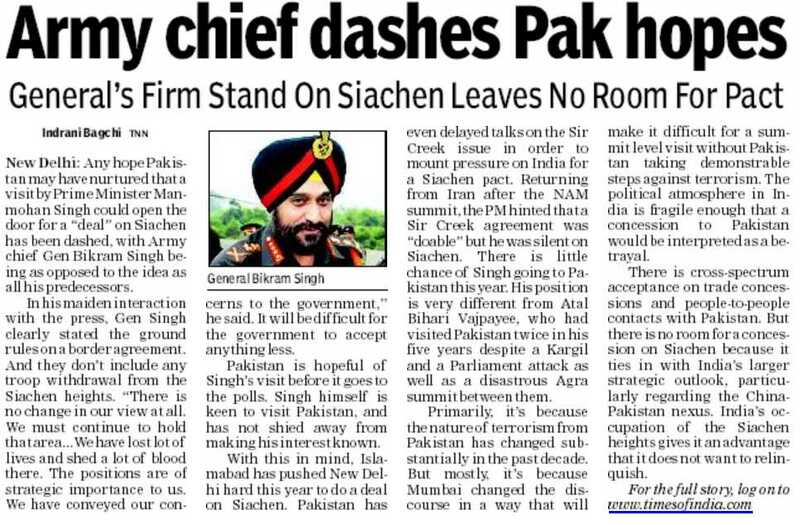 NEW DELHI: Any hope Pakistan may have nurtured that a visit by Prime Minister Manmohan Singh could open the door for a "deal" on Siachen has been dashed, with Army chief Gen Bikram Singh being as opposed to the idea as all his predecessors before him. In his maiden interaction with the press, Gen Singh clearly stated the ground rules on a border agreement. And they don't include any troop withdrawal from the Siachen heights. "There is no change in our view at all. We must continue to hold that area...We have lost lot of lives and shed a lot of blood there. The positions are of strategic importance to us. We have conveyed our concerns to the government,'' he said. It will be difficult for the Indian government to accept anything less. Pakistan is hopeful of Singh's visit before it goes to the polls. Singh himself is keen to visit Pakistan, and has not shied away from making his interest known. With this in mind, Islamabad has pushed New Delhi hard this year to do a deal on Siachen. 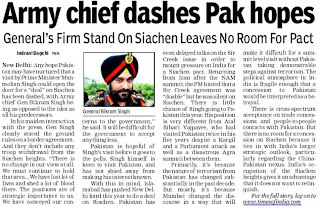 Pakistan has even delayed talks on the Sir Creek issue in order to mount pressure on India for a Siachen pact. Returning from Iran after the NAM summit, the PM hinted that a Sir Creek agreement was "doable" but he was silent on Siachen. There is little chance of Singh going to Pakistan this year. His position is very different from Atal Bihari Vajpayee, who had visited Pakistan twice in his five years despite a Kargil and a Parliament attack as well as a disastrous Agra summit between them. Primarily, it's because the nature of terrorism from Pakistan has changed substantially in the past decade. But mostly, it's because Mumbai changed the discourse in a way that will make it difficult for a summit level visit without Pakistan taking demonstrable steps against terrorism. The political atmosphere in India is fragile enough that a concession to Pakistan would be interpreted as a betrayal. The UPA has already taken several knocks after the Sharm-el-Sheikh joint statement with Pakistan in 2009. In the forthcoming state elections, political managers fear a PM visit to Pakistan could be battered on nationalistic lines. There is cross-spectrum acceptance on trade concessions and people-to-people contacts with Pakistan. But there is no room for a concession on Siachen because it ties in with India's larger strategic outlook, particularly regarding the China-Pakistan nexus. India's occupation of the Siachen heights gives it a unique advantage that it does not want to relinquish. Officials said India's position on Siachen had neither hardened nor softened for years. But Pakistani Army chief Gen Ashfaq Kayani had said twice in a month (May) that Pakistan wants the Siachen issue to be solved and India had "toughened" its stand asking for a demarcation, which was seen here as a pressure tactic. Ideally, a Siachen agreement should be part of a broad agreement of the border, but Pakistan is yet to agree to that. "We have been consistent on the steps necessary before demilitarization of Siachen can be carried out. We won't give up the advantage we enjoy without a very credible, and verifiable, commitment from their side," a senior Indian Army officer told TOI recently. Another officer pointed out that India has repeatedly pointed out that any demilitarization should be preceded by delineation of Actual Ground Position Line (AGPL), authentication of the line and military positions on maps to be exchanged between the two countries, an end to wrong projection of AGPL in each other's maps, drawing up framework for demilitarization and as final step withdrawal of troops from the glacial heights. "They are reluctant to agree to our suggestions," another senior military official said. The core of the difference between the two sides is this: India wants Pakistan to authenticate positions on the AGPL before any talk of demilitarization or withdrawal. Pakistan is pushing a four-point plan that includes demilitarization, withdrawal of troops, delineation and authentication. India is unwilling to do this.